The Masonic Lodge in Winona, MN had a series of 99 hand painted historic scenic drops that were originally used as part of the Freemason rituals. Created by the Sosman and Landis Company of Chicago, these drops were supported by a system of wire ropes and sheaves known as a counterweight rigging system. The original system would have likely been installed in 1909, soon after the building was constructed. In 2014 the City of Winona asked LVH Entertainment, a subsidiary of Thern, Inc. to provide an inspection for the Masonic Lodge after a handline broke during operation. The inspection revealed that the majority of the rigging system was original and untouched since its installation in 1909. Many of the original rigging components, such as loftblocks and headblocks, were constructed using steel sheaves with wood sides and were nailed to the wood beams of the building. After a century of use, it was obvious that a new rigging system was needed to provide modern safety values to the apparatus that held heavy objects over the heads of actors and other stage personnel. In order to fit 99 drops in 25 feet of stage depth, the original system had been laid out on 3-inch centers. However, the system was designed with the original needs of Freemasonry in mind, not requirements of a vaudeville or opera house – venues that share much more similarity with modern proscenium theaters. There were no stage curtains in the original Masonic Lodge and at the time, electric lighting was in its infancy. Modern theaters now use many different curtains and an assortment of lighting, much of it hung from the rigging system. The City could save all of the drops and meticulously restore the rigging system, or remove the drops and install a system fit for a modern performance space? There was much public discourse over the fate of the historic drops. The city chose to compromise, thanks to a grant from the Minnesota Historical Society. A new rigging system with both counterweight and motorized linesets would be installed, and a portion of the system would be dedicated to hanging some of the original drops. Thern Inc. and LVH Entertainment were honored to be chosen for this exciting restoration of a historic building in their hometown community of Winona, MN. The old wood loftblocks and head blocks were removed, though 12 original counterweight arbors were kept in place for historical display. The original asbestos fire curtain was abated and all equipment supporting the fire curtain was removed. New steel was brought in for headbeams and loft beams – because the old wood grid wasn’t up to the task. A new loading gallery was built to support the steel counterweight bricks and was intricately positioned through the original massive steel truss that supported the stagehouse roof. 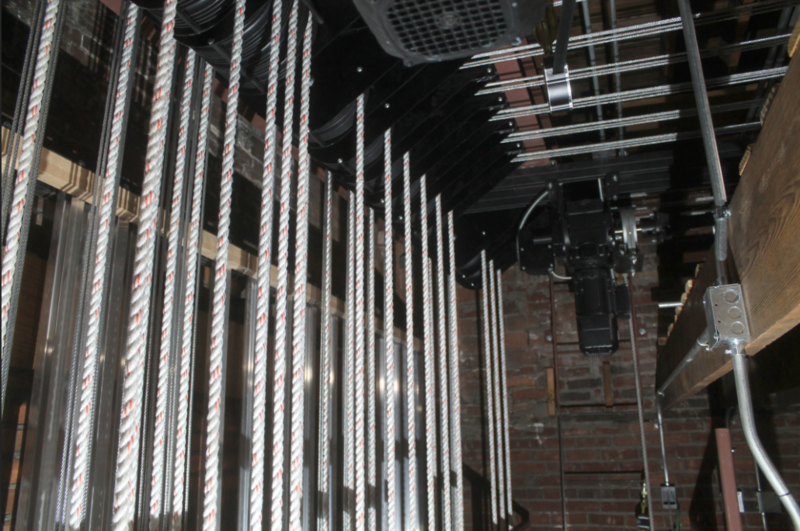 The rigging system newly installed in the Masonic Lodge is comprised entirely of components built by Thern and installed by LVH Entertainment. 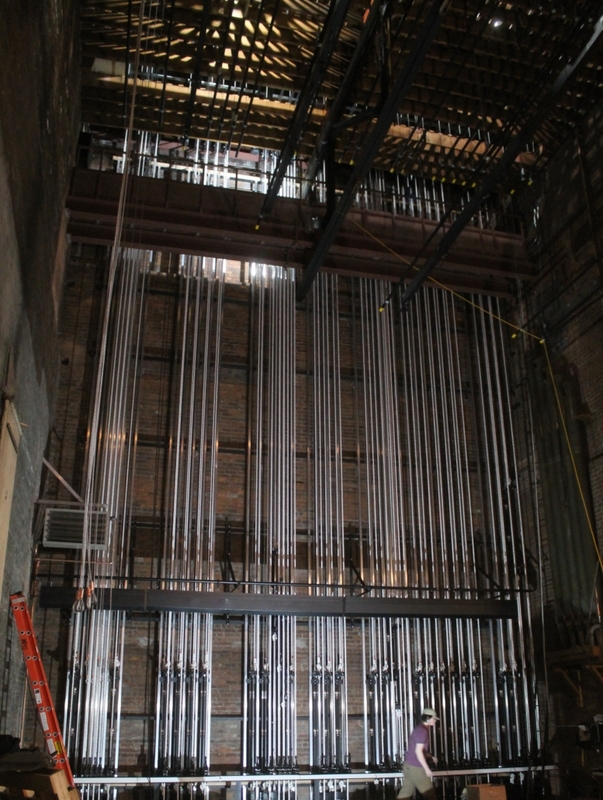 The space has 23 general purpose manual counterweight linesets on 8-inch centers that allow for both curtains and scenery to be hung. 10 manual counterweight linesets on 3-inch centers are dedicated to the historic drops are placed among the general purpose line sets. The narrow center spacing of these line sets required custom ganged head blocks and custom arbor guide shoe designs. 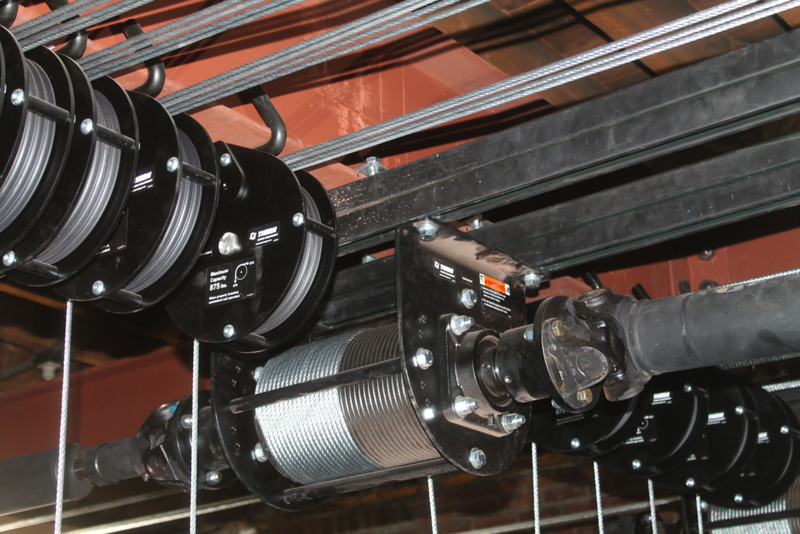 In addition, 4 motorized lineshaft hoists, dedicated to lighting (known as Electrics in theatrical parlance) each allow 2000 pounds of specialty theatrical lighting to be safely supported overhead. The lineshaft hoists are operated using a touchscreen controller that positions them to an accuracy of 1/8 inch. The Winona Masonic Lodge is now equipped with a theatrical rigging system that can support modern 21st-century performance demands while entertaining its patrons with historic 20th-century architectural works of art have been transformed through an amazing restoration process.